Classic 350 with great street manners, and vacuum for all your power accessories. This engine was designed to run with all your vehicles stock components. Must have a chip burned, upgraded intake and headers for optimal performance. Great crate engine noticeable Idle, but still good vacuum for you power accessories. 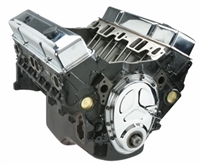 This engine is an upgrade for 1996-2000 Chevy trucks or SUVs the ECM must be tuned and headers are need to get the full potential out of this engine. We test this engine with an aftermarket EFI system on an engine dyno, power ratings may vary. This engine has a STD bore and it 100% new with a fair idle and will run on 87 octane fuel. Great crate engine with a noticeable idle, very street able with lots of power. Chevy 383CI Stroker for the 1987-1995 Chevy Pick Up trucks. This engine was designed to perform on the street or strip without having to worry about reliability.